Soon after the Robin Hood, we slip back down into the ditch via some handily located steps in what looks like (but isn’t) part of somebody’s garden. We are back on the line of the northern lip of the ditch, although along here it has been greatly degraded over the years to the point where it is barely noticeable in places. The Wall climbs very gently to a crest, just before which it changes course onto a new alignment, almost due east (since Milecastle 20 we have been on a slightly more southerly line). The fact that this realignment happens before we reach the crest has led one researcher to suggest that you can tell the way the Wall was laid out (but not necessarily built: they were two different processes) by the convenient fact that roads and mural barriers tended to use the far side of a hill and not the top to sight their lines. Hence, if this supposition is correct, this section was being laid out from east to west. 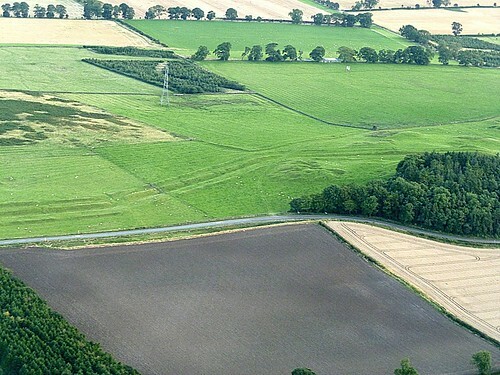 Interestingly, the Vallum, which has been running parallel with us for some way, ignores this turn and ploughs straight on across the countryside, flattened now but still visible from the air as a crop or soil mark. After that turn, and some 200m down the gentle slope towards the by-now-very-obvious Whittledene reservoirs, we reach a point opposite the location of Milecastle 17 (Welton). This was a short-axis milecastle, excavated in 1931 and 1999, its northern part lying beneath the modern road. The Trail takes us over the road and onto the north lip of the ditch for some 300m, recently cleared of vegetation so that it is now easier to see. 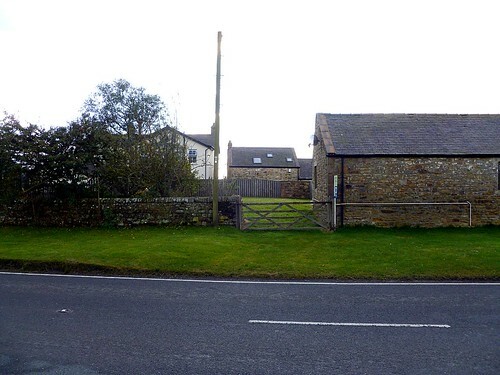 Then we have a detour to negotiate, taking us to the north of Wall Houses farm. We return to the north lip of the ditch again for the next stint, which brings us to another Millennium Bridge which actually takes us over the ditch. We are then, rather spectacularly, trotting along the verge of the Military Road, traffic roaring past at 60mph (so care is advised, naturally) until we dive into the next section of fenced-off Trail which actually takes us along the bottom of the ditch (we haven’t been here for a while so it is a welcome return to this particular perspective for our mural ramblings), emerging next to the incongruously named Robin Hood pub. 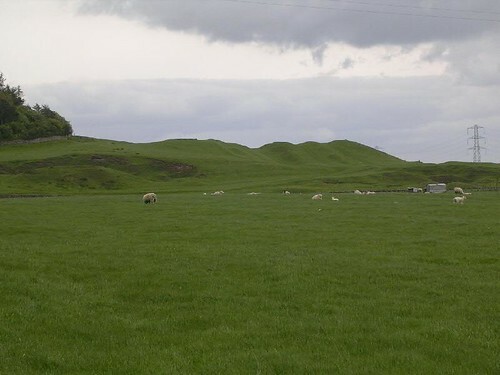 We have actually overshot the location of Milecastle 18, which is on the other side of the road, some 150m back to the west, in the entrance to Vallum Farm. Gelatophiles will doubtless already know that there is a rather fine ice cream parlour located at the farm, but should you fancy indulging, you will have to back-track along the verge and negotiate crossing the road once more. It goes without saying that there is nothing to see at Milecastle 18 (East Wallhouses), but excavation in 1931 showed it to be of the long axis type. The Handbook speculates that differences in construction suggest it was started by one legion but finished by another; perhaps they had all gone off for ice creams. After 145m we have to cross the road again (we haven’t finished dodging traffic yet, unfortunately) but before we do we can have a peep over the wall and see the ditch lurking to the north of the Military Road. We carry on to a junction. 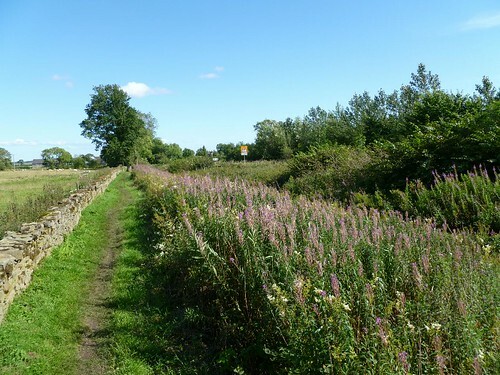 After we cross that, a rather flamboyant stile takes us over to a length of the Trail that runs to the south of the road, separated by a wall and hedgerow which is, on a nice day, one of the most pleasant stretches of the wall walk and usually a good place to see butterflies. The traffic is almost unnoticeable here, strangely. 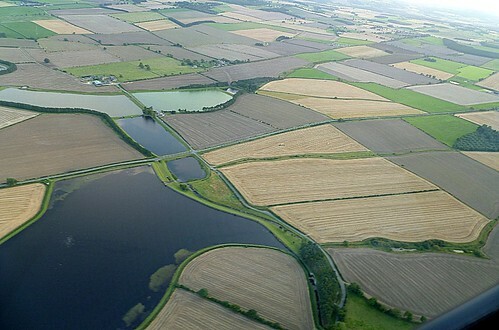 To our right, the Vallum is a very shallow (almost imperceptible) ripple in the arable fields, still visible from the air, but nigh on vanished at ground level. This then, more or less sums up the rest of this stretch. 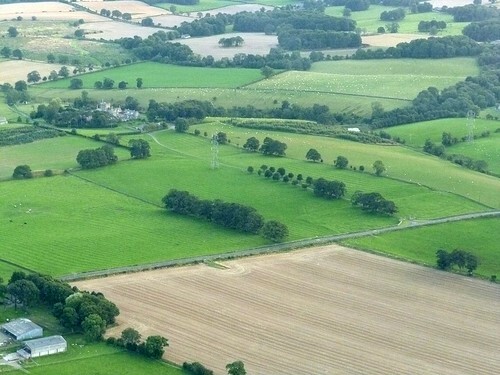 The curtain wall is to the north of us, beneath the southern carriageway of the Military Road; the ditch is beyond the road, amongst the trees; and the Vallum is sneaking across the fields to our south. In this fashion, we arrive at the site of Milecastle 19. 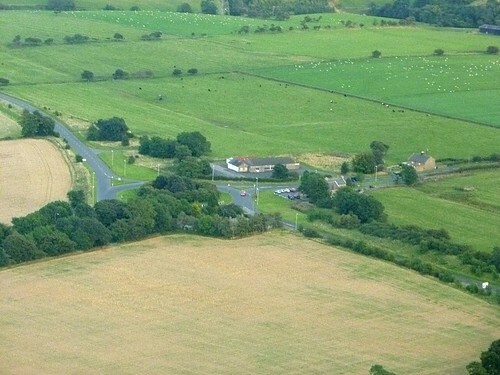 Milecastle 19 (Matfen Piers), located opposite the eponymous estate-guarding piers on the north side of the road, has been examined in 1932 and 1999. An altar to the Matres was found, dedicated by cohors I Vardullorum, who we know were at Corbridge during the mid-2nd century AD. 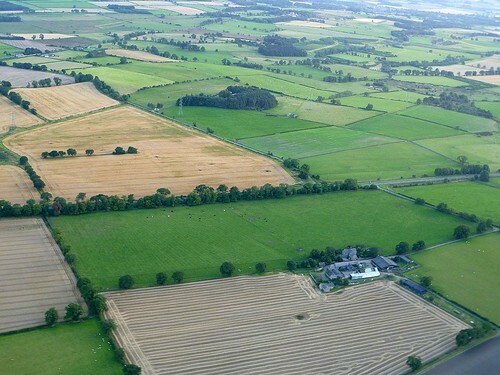 The plantation on Down Hill itself is eye-catching in its own way, but cannot match the silhouette of the Vallum as it soars over the crest of the ridge. Walking towards it, we can make out all of the features we know and love, but in the sort of detail we could only imagine before: the central ditch with its mounds to north and south, as well as an unmistakeable marginal mound on the southern lip of that ditch. 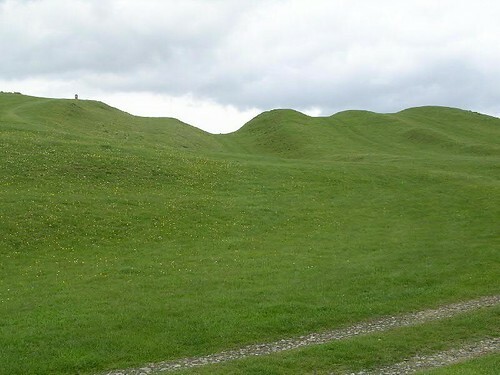 As we climb up past the earthwork (the Trail respectfully slips to the north of the north mound), we can look back and see how this magnificent feat of earthmoving is all but removed to the west of us, first viciously by quarrying, then insidiously by ploughing. The Trail leads up over towards the woods and we can now appreciate that the Vallum has in fact made a vast angular detour to avoid the limestone outcrop of Down Hill, just as the Military Road does to the north. The curtain wall, however, bounds on regardless through the trees, accompanied by the ever-faithful (and, at this point, rock-cut) ditch. For a few metres it is relieved of the burden of the road, but it will soon be back. By now the spectacle of the Vallum to the east has come to our attention, striding over towards Carr Hill farm. 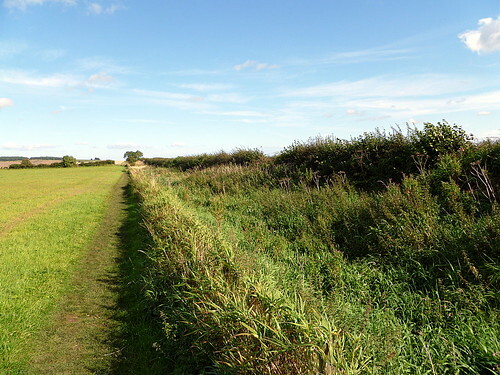 There are finer stretches of Vallum, but none you will see up-close and in-the-flesh by walking the Trail, so take a moment to enjoy it. The Trail heads up to Carr Hill where an ingenious system of stiles takes us over a field entrance like slow-motion hurdlers and then, after one more set of steps, unceremoniously onto the verge. You are beginning to sense that crossing the Military Road is about to be warned about and you are correct. Here we go again: all due caution exercised, we can venture over to the north side past a lay-by big enough to park a destroyer in it (well, a corvette, perhaps) and then the Military Road and, its inspiration, the curtain wall make a turn from just north of easterly to just south of it. 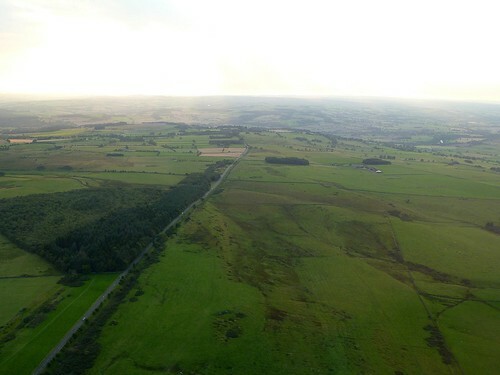 Nowadays the road sweeps round in a grand curve but the original line, with its abrupt angle, is preserved by the northern marginal field wall. Although it looks like we are walking on the northern pavement of the road, we are of course on the berm between the curtain wall (under the road) and the ditch (a mere shadow of its former self, off to our left). We now have to get used to walking by the road. There is going to be a lot of this until we reach the end, but fear not, there are pleasant interludes yet to come. 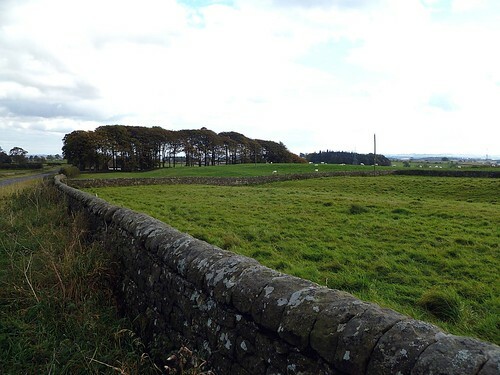 To our right, as we walk slightly downhill, we can see some buildings and the second steading, just past some conifers, is Halton Shields, the site of Milecastle 20 and the end of the sixtieth Roman mile of our journey. Milecastle 20 (Halton Shields) lay at the eastern end of the buildings but there is, of course, nothing to see now, although it was examined in 1935 and found to have a type III northern gateway. Leaving the major highway north of Dere Street behind us, we head gently downhill towards a rather important little stream, one of the tributaries of the Cor Burn. By the time this reaches the Tyne next to the Roman site at Corbridge, it has been tapped by the aqueduct which supplied the Roman fort and town there and the remains of which are still to be seen on the site. 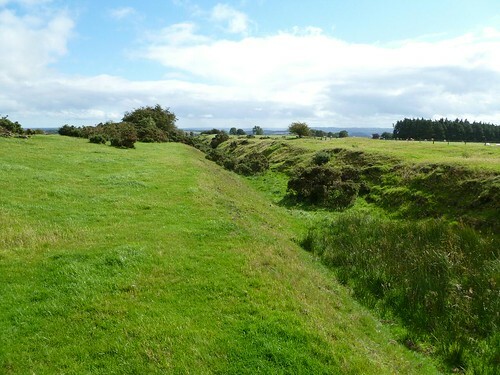 The Vallum is still visible to our right and the Military Road once again on top of the curtain wall. 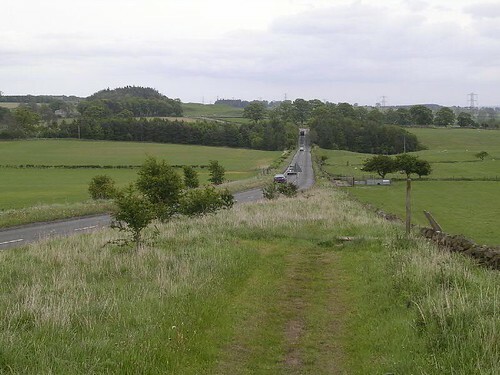 We cross the burn and head up the other side to a plateau which is in fact the fort platform of Halton Chesters (you will find it written as both Haltonchesters and Halton Chesters in the literature), lying partly in the parkland of Halton Castle, further to the south. 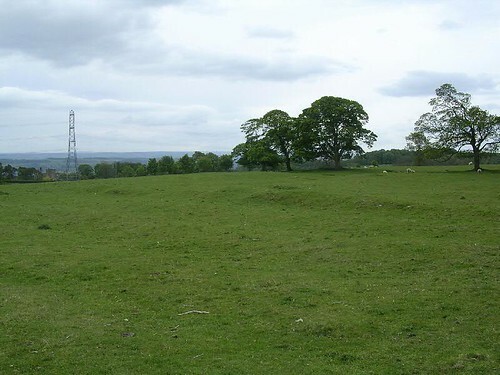 Halton Chesters is 8.8km (5.5 miles) from Chesters and is 2ha (4.8 acres) in area, having been enlarged from 1.7ha (4.3 acres) with a rather unusual western extension south of the curtain wall (making it the only fort on the Wall with an L-shaped plan). Its initial garrison is unknown but it may have been a mixed cohort. The increase in size may be because it later held the ala I Pannoniorum Sabiniana. Once again placed astride the Wall, it – like Chesters – had six gates. A large internal bathhouse was excavated near the western defences, north of the modern road, in the 19th century, with barracks to the east of it. To the south of us, granaries were examined, but most of our knowledge of the site comes from a detailed geophysical survey. There is nothing to see of the site today beyond the fort platform and a few humps and bumps to the south of the Military Road, whilst to the north the fort is still under the plough. 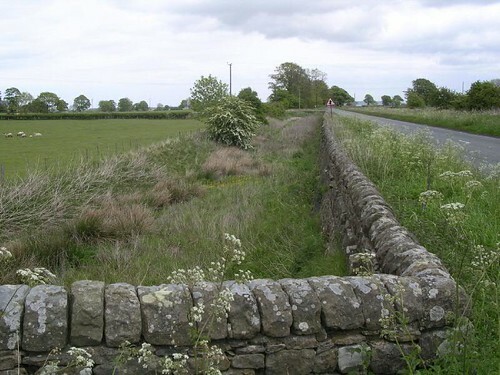 We leave the fort and enter the pinchiest of pinch points, the Trail being sent along a narrow fenced-off alleyway at the northern edge of the fields, immediately south of the wall bordering the Military Road. We follow this past Halton Red House (to the north of the road) before we emerge, blinking, into the open, grassy (but almost lunar) landscape near Milecastle 21. 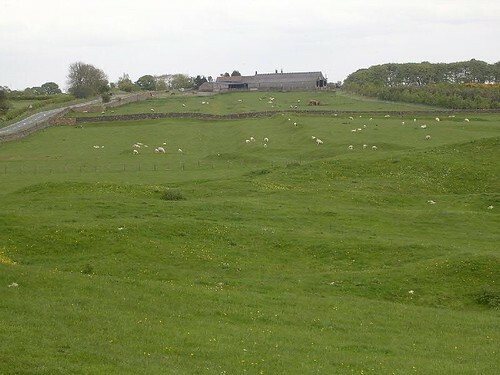 This area has been much quarried, not only completely removing a short stretch of the Vallum (which, as we are about to find out, is a fine upstanding earthwork just to the east) but also the curtain wall and the milecastle itself, for the Military Road suddenly veers off briefly to the north to skirt round Down Hill. 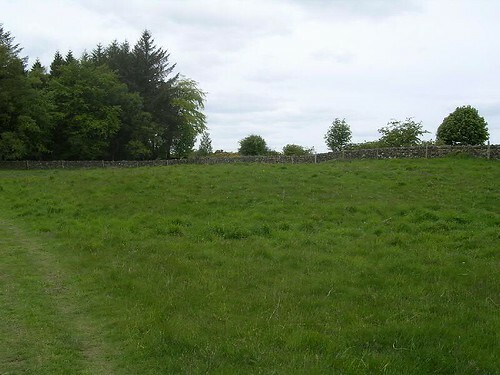 Nothing survives of Milecastle 21 (Down Hill), beyond the suggestion that it ought to have lain somewhere close to where the track meets the Military Road. We are now accompanied by a fine stretch of the Vallum on our right-hand side, decorated with a welcome burst of gorse. The line of the curtain wall remains off to our left, under the Military Road, and the ditch beyond that. We cross a stile then, after crossing another field, come up to a lane that must be negotiated by means of a short dogleg. Now we are alongside the Vallum, immediately to our south, and making our way across this field, over another stile, and into the next, Dere Street now in sight. A fine section of ridge and furrow cultivation can be seen to our left, and then we find ourselves at the road and the opportunity for a break in the Errington Arms, where it is possible to sample the magnificent Port Gate pie. Dere Street passed through the Wall by means of a gateway. This tends to be known as the Port Gate, but in reality the name pre-dates the discovery of the gateway by several centuries, probably deriving from the fact that, in medieval times, the old Roman road was used to carry (‘port’) goods (and especially livestock) along the road (‘gate’) to Stagshaw Fair, just to the south. Gate is one of those words that occurs in both Norse (gata) and Anglo-Saxon (geat) and, having the same root, means ‘road’ or ‘street’ (as well as the more obvious ‘gate’): think Gateshead – which, pace Bede, has nothing to do with goats, but which was also on a (largely goat-free) Roman road. Excavation showed that the Port Gate gateway (which lies buried to the south-west of the roundabout, next to the pub), had projecting flanking towers. Horsley first saw it but thought it was an extra milecastle; in reality we have yet to reach that. 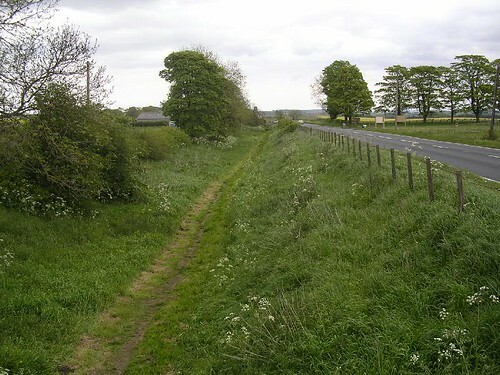 The Trail now crosses Dere Street, more prosaically these days known as the A68, where we must needs be exercise extreme caution once more, and heads off along the remains of the old Military Road (the approaches to the roundabout have all been modernised and taken off their original lines). We soon cross the drystone wall to our right by means of a stile and land just after Milecastle 22 (Portgate). No surprise to learn that this was found to be a long-axis milecastle when it was examined in 1930, but intriguing to discover that the northern gateway was, later in its life, completely blocked (perhaps as a result of its proximity to the Port Gate gateway). We are now south of the curtain wall, marked by the Military Road, of course, and are going to stay on this side for a couple of miles. The Vallum has now sprung to life as an earthwork to our right as we move through the open scrub east of Milecastle 24. There is considerable disturbance from small-scale post-medieval quarrying around here, but before long we reach a minor road. Crossing this we enter Stanley Plantation, although keeping to the northern edge of it. Occasionally, through the lofty softwood trees, we can glimpse the Vallum keeping pace with us just to the south, but it is as well to concentrate on one’s footing around here, since some of the bits can be quite boggy (the worst being reinforced with stone paving slabs and plastic mesh). Although we can’t see it from our course, the ditch continues to the north of the road. Soon we encounter a track through the plantation. 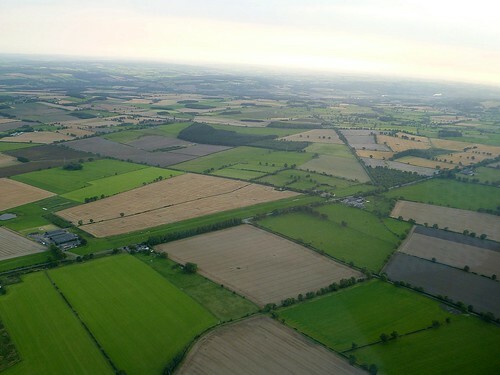 Many years ago, a proposal was mooted to test drill for oil in the plantation, summarily dismissed after a public enquiry, since it would of course ruin one’s appreciation of the ancient monument (which, at that time, had just become a World Heritage Site, the defined limits of which were, shall we say, a bit wobbly then). This ensured some wry smiles, as traffic roared past on the 18th-century Military Road, the terrain-following Tornadoes, Harriers, and Jaguars of the RAF thundered over at 250ft, and the 148m-high BBC Stagshaw radio mast (which is actually at Beukley!) towered serenely over its ‘ancient’ setting. Landscape is always in the eye of the beholder. The micro-climate in the plantation is always calm and cool, the trackway sometimes boggy and occasionally sloppy, and you must make a conscious effort not to examine every stone of the roadside wall for an inscription that everybody else who trots past may have missed. Soon, however, we reach the end of the plantation and, with a deft wiggle, the Trail dumps us back into the broad open spaces again. As we emerge from Stanley Plantation we immediately encounter the earthworks that mark the location of Milecastle 23 (Stanley). Another long-axis milecastle, this was – like its neighbours we have just passed – examined in 1930.